Spring has arrived. We’re delighted to see flowers popping up all over our campus, from daisies to tulips to pretty flowering trees. All of that lush greenery and bright color is such a treat after a long winter. But did you know that it has health benefits for seniors, too? Decrease in depression – With flowers present, participants experienced improved mood and greater happiness than those without flowers. 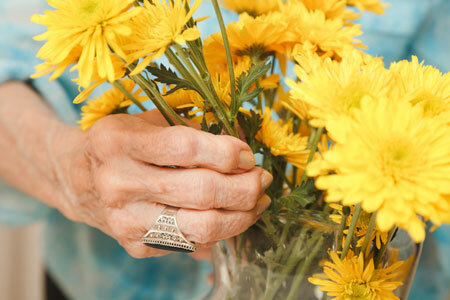 Refreshment of recent memory – Seniors with flowers in their homes performed better on memory tests. Socialization – Seniors with flowers in their homes were more likely to engage with friends, family, and community. Researchers say that the positive impact is more than just our association with flowers as gifts. They’ve suggested that there could be many reasons for our delight. Flowers can signify a plant has fruit, and the colors, shapes, fragrances, and textures stimulate many of the senses. You can bring the mood-boosting benefits of flowers and greenery indoors, too. Indoor plants and the vibrant colors they inspire benefit everyone! Here are some tips for bringing spring’s blossoms – and all of their healthful benefits – indoors all year round. Cut flowers – A bouquet of cut flowers is a sure way to brighten up a senior’s space. Look for unexpected places to bring color and fragrance, like a bedside table. Plants – Plants, especially flowering plants, connect seniors to nature and the rhythm of the seasons. Plus, they’re excellent for improving air quality. Peace lilies are a low-maintenance favorite, with large white flowers in the spring. For bright winter blooms, consider holiday cactuses and kalanchoe. Container gardens – Container gardens are an ideal choice for seniors who enjoy gardening, but have limitations on space or activity. Paint – Certainly painting walls can change the mood of a room! Where walls can’t be painted (or a senior’s favorite color is too bright for a full wall), bring in colorful accessories like pillows, blankets, art, and decorative objects. Not only does color change the feel of a room, it can also improve a senior’s mood and abilities. Warmer colors like oranges and reds improve focus and appetite. Cooler colors such as lavender and blue are calming and encourage reflection. Pink has been shown to bring calm, and natural green hues that evoke the outdoors are both calming and balancing.